After we moved into our new house last week I went on a big hunt for a garden center to stock up on plants and along the way I stumbled into a store called HomeSense which is exactly like HomeGoods back in the States, lucky me! I found these copper mugs there and snapped them up because I’ve been meaning to share a Moscow Mule variation with you for ages but it felt wrong to serve it in anything else. 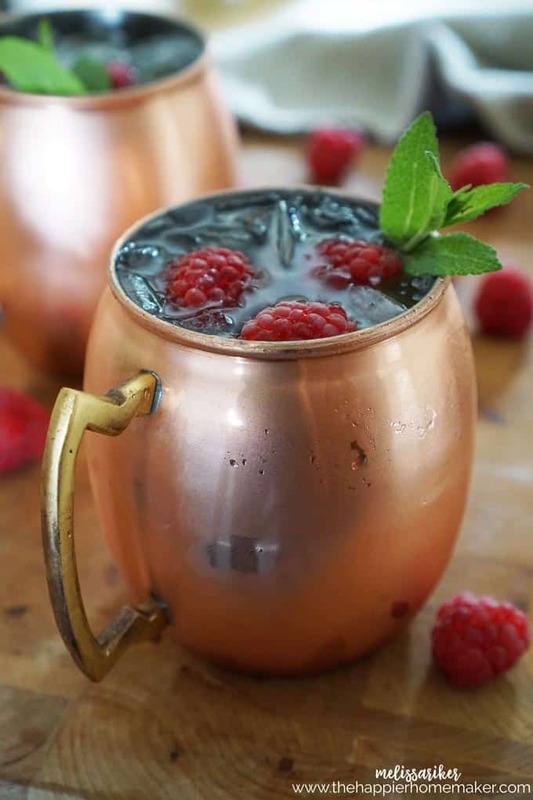 This Raspberry Moscow Mule is perfect for summer entertaining, a little fruity twist on the refreshing original. Combine all ingredients with ice in a cocktail shaker and shake vigorously. Pour over crushed ice and top with ginger beer. Garnish with raspberries if desired. Easy enough right? Even the most clumsy cocktail aficionado could whip these up! Did you know that Moscow Mules were one of the first vodka cocktail recipes created? It was used to market vodka to the United States in the 1930s where it had been previously unknown for the most part. Try one and let me know what you think, you can even share a picture and tag it #thehappierhomemaker so I can see your cocktail creation! 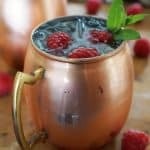 Even the most clumsy cocktail aficionado can whip up a Raspberry Moscow Mule with ease-this is a simple fruity spin on the original recipe. Combine all ingredients with ice in a cocktail shaker and shake vigorously. Pour over crushed ice and top with ginger beer. Mmm. Gonna have to try this. Thanks for sharing!